Sonivate Medical develops and markets innovative ultrasound technology and participates in the world-wide $7 Billion market. The company’s technology opens new markets for ultrasound by extending its use especially with “ease of use and preference” for new users. Sonivate has been financially supported by grants from the US Department of Defense and private investors. 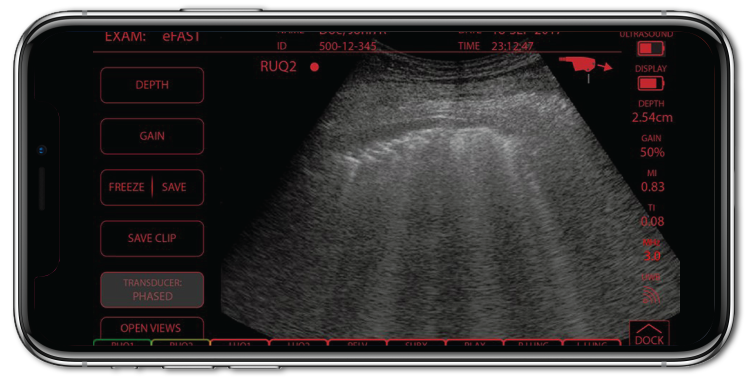 The SonicEye® is a fingertip-mounted ultrasound probe that combines ultrasound imaging with simultaneous tactile feedback, while leaving both hands free to do work. Its ergonomic design makes ultrasound intuitive and easy to learn, especially for new adopters. The miniature probe replaces the traditional handheld transducer in many clinical applications. Ultrasound guidance with this probe will change the way we do our procedures. My ability to stabilize and do fine manipulations is really improved. With the emphasis on speed and accuracy in the performance of peripheral nerve blocks, the finger probe has unlimited upside and potential. Approximately 15 percent of injuries sustained in conventional land warfare involve the thorax. The Army wanted a simplified, noninvasive diagnostic tool for first responders, rather than the conventional ultrasound machine that is wheeled around on a cart. We developed the SonicEye Wearable System that allows doctors and field medics to use one finger to image; leaving both hands free to simultaneously perform procedures. The Sonivate Dual-Plane App features an easy-to-use, intuitive graphical interface. Our app was designed featuring prominent command buttons that allow for rapid use in the field. The display features both day and tactical light mode. Record names, ID’s, save clips, freeze images, adjust depth and gain, and much more. The display can either guide the novice user through the eFAST exam, or Manual Mode for the more experienced user. Sonivate Medical has received funding totaling $8.7 million through the SBIR and BAA programs and most recently was contracted through the Combat Casualty Care Research Program to develop a light weight, portable ultrasound system for forward deployment. This product will compete in the hand-held/mobile segment which is growing at 20+% annually. The SonicEye APP will work in both a Windows and Android environment.